At Web of Life Field (WOLF) School, we believe that youth thrive outdoors! 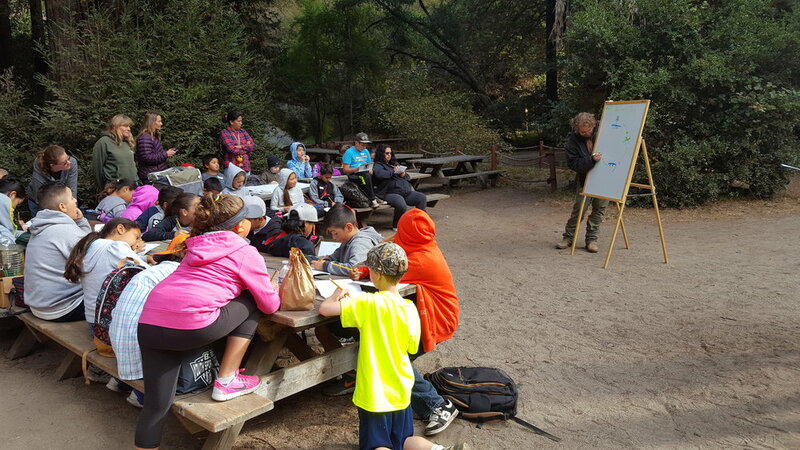 Our K-12th grade residential outdoor education and team building programs inspire California’s students to explore, discover, and learn through exciting field study activities, group building initiatives, fun songs, active games, and living together in a community. Programs are led by professionally-trained naturalists at stunning camps throughout California, are California State Standards-based, and support Next Generation Science Standards (NGSS), giving students the opportunity to make hands-on connections between classroom learning and the world around them in a safe and positive outdoor environment. Choose from one of our programs below, match it with the perfect WOLF School campus for your students, and get ready for a remarkable adventure! Experience hands-on science education in the beauty of the redwoods, at the beach, or in sierra pine forests. Students will explore the concepts of Energy, Cycles, Change, Adaptations, Communities, Interdependence, and Diversity. Personal Awareness. Community Commitment. Students will discover keys to successful communication, responsibility, and personal growth through unique initiatives that summon positive choices, cooperation, and respect. Take a journey through California’s history! Students will learn about native peoples, our environment, the Gold Rush, and our natural resources through the eyes of immigrants, pioneers, Native Americans, and prospectors. Pricing and scheduling for WOLF School varies depending on program specifications, number of participants, length of stay, and campus location. Please do not hesitate to contact us to discuss your options! Our main goal is to get kids outdoors, and we strive to work with all schools, regardless of financial concerns. We can’t wait to work with you to find a way to connect your students with nature. Find basic program information, along with comprehensive handbooks to guide teachers, chaperones, and parents/guardians through the WOLF School experience.